Platinum nanoparticles (Pt-NPs) with sizes in the range from 10 to 30 nm were synthesized using protein-directed one-pot reduction. The model globular protein bovine serum albumin (BSA) was exploited as the template, and the resulting BSA/Pt-NPs were studied by transmission electron microscopy, energy dispersive X-ray spectroscopy, and resonance Rayleigh scattering spectroscopy. The modified nanoparticles display a peroxidase-like activity that was exploited in a rapid method for the colorimetric determination of hydrogen peroxide which can be detected in the 50 μM to 3 mM concentration range. The limit of detection is 7.9 μM, and the lowest concentration that can be visually detected is 200 μM. 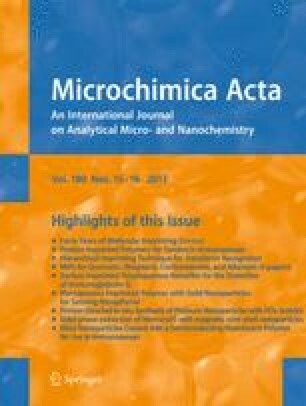 Pt-NPs were synthesized using BSA-directed one-pot reduction and BSA/Pt-NPs composite can effectively catalyze the oxidation of TMB producing blue solution in the presence of H2O2. The online version of this article (doi: 10.1007/s00604-013-1068-6) contains supplementary material, which is available to authorized users. This work was financially supported by the National Natural Science Foundation of China (No.21075078, 21105056) and the Natural Science Foundation of Shandong province, China (No.ZR2010BM005, ZR2011BQ001).